Almost every garden has a shed area, beneath trees, next to buildings, along fence lines and on the shaded side of taller growing evergreen shrubs. You can add some life and color by exploring the world of plants that will flower in shade. A number of specialist nurseries carry a range of plants, with varieties available for all types of shade situation. Shade comes in lots of forms, dry shade, damp shade, deep shade and filtered shade are examples. Although flowering plants some of these situations might seem a little difficult to find, a large variety are in fact available. All gardens have shade, and with the right plants you can have flowers in most positions. 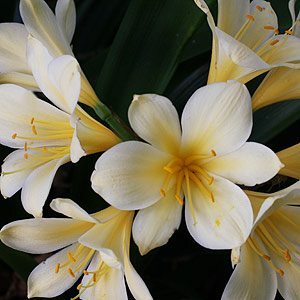 A few classics are Daphne and Clivia, however the range is wider than these two stalwarts. Finding the right plant for your shaded garden. It is some time difficult to find the right plant for that shaded position, we look a nurseries that carry a good range of plants for shade and semi shade. The degree of shade, the soil and the climate all play a part in selecting the right Shade Flowering Plants, some plants require moisture and others will grow well in dry shade. It is the difficult positions next to buildings, beneath trees and along the shaded side of a fence that many of the specialist nurseries listed will be able to recommend a range of plants to suit almost any conditions. Some shade plants will have foliage as the feature with flowers as a addition, others will feature wonderful colourful flowers that will brighten any shaded area in the garden, some will be evergreen and some deciduous.